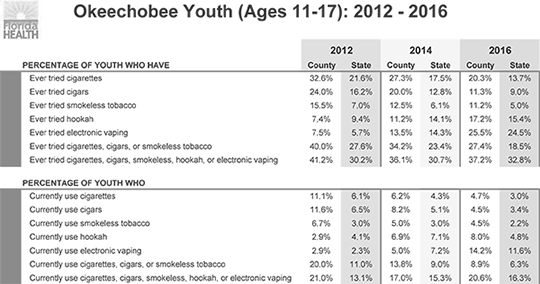 The Tobacco Free Partnership of Okeechobee is excited to announce the Florida Youth Tobacco Survey Results for Okeechobee County; statewide data for 2016 has also been released. This release of data is something that the Tobacco Free Partnership and SWAT Students of Okeechobee look forward to. This data enables public health professionals, students, teachers, parents, and the public to explore information pertaining to youth tobacco use. The Florida Youth Tobacco Survey (FYTS) was administered in the spring of 2016. A total of 753 public high schools and middle schools in the 67 Florida counties participated in the FYTS. There were 69,640 students who contributed to the 2016 FYTS; 33,558 at the high school level and 36,082 at the middle school level. We are proud to report that Okeechobee county experienced a decrease in the percentage of youth who have tried cigarettes, cigars and smokeless tobacco. In fact, the data exhibited a 7% reduction in the number of those who have ever tried cigarettes. The data showed a 8.7% decrease in the number of those who have ever tried cigars, and a 1.3% decline in those who have ever tried smokeless tobacco. Additionally, we see similar drops in the percentage of youth who currently use cigarettes (1.5% decrease), cigars (3.7% decrease) and smokeless (.5% decrease). For years, tobacco prevention has been at the forefront of providing education and information to decrease the use of tobacco in the Country, State of Florida and in Okeechobee County. It is apparent that our prevention and education work continues to pay off as we have seen a decrease in cigarettes, cigars and smokeless for several years now. However, the raging epidemic of electronic cigarettes, hookah and vaping that Big Tobacco has created is minimizing the hard work that we have done to decrease tobacco use in this country. We are seeing these effects nationwide, statewide and throughout Okeechobee County. In fact, since 2014 there has been an 9.2% increase in the percentage of youth in Okeechobee County who currently use electronic vaping, and a 12% increase in the percentage of youth in Okeechobee County who have ever tried electronic vaping. Additionally, we also see an increase 5% in the number of youth in Okeechobee County who have ever tried hookah. While we are extremely concerned about the rise of electronic vaping, we are extremely proud that our Okeechobee County youth had an increase in the number of youth who are committed to never using cigarettes, which is now up to 72.6%, which is a 12.3% increase since 2014. Moreover, our continued work with the Okeechobee County School District has helped decrease the usage of cigarettes, cigars, smokeless tobacco and electronic vapors on school property. “We have a lot to be thankful for, but also have a lot to work on around electronic nicotine delivery devices. The Tobacco Free Partnership of Okeechobee County and Okeechobee County SWAT Chapter is committed to making Okeechobee a healthier, tobacco-free County,” said Courtney Moyett. If you would like the full report on the Florida Youth Tobacco Survey, more information on how to get involved or have any questions, please contact Courtney Moyett at cmoyett@quitdoc.com or (863) 801-8277.